Compressed non-asbestos sheet is made from inorganic and aramid fibers with a Nitrile (NBR) binder. This material is capable performing at high temperatures and with a variety of oils, gases and light chemicals. Use can also reduce emissions compared with more permeable rubber gasket materials in applications where gases can escape into the atmosphere. It has excellent sealing properties and can also be ordered with Neoprene or EPDM binder for versatility in many applications. 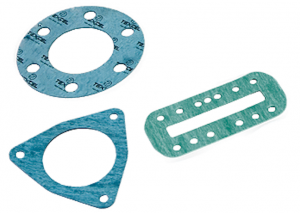 Non-asbestos sheet is designed to replace gaskets and seals that historically contained asbestos materials to meet the requirements of high performance gas and chemical applications. *Temperature effects pressure capability inversely. Thicker sheet materials will also perform best at lower max temperature under pressure. Please see pressure X Temperature calculation above and contact us for further information on high temperature applications.